When did you start going by “the jellyfish lady”? 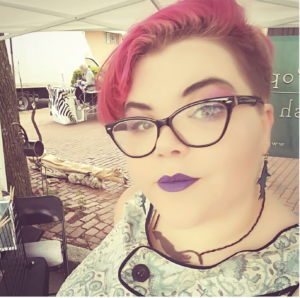 I started going by The Jellyfish Lady in 2016, when the children of my local art fair, Beverly Arts Festival recognized me from my previous year participating. Multiple little fans of my crocheted pals ran up to the tent yelling “The jellyfish lady is back!”, and I endearingly pocketed the name. What is it about jellyfish (and related marine life) that inspires your art? I’ll start with the broader one first- Marine life has always been something that pulled at my curiosity. Watching Blue Planet and visiting the Aquarium as a munchkin was as enrapturing as sci-fi movies. The creatures were alien, ethereal and moved (most of the time) with such unfathomable grace. It left a large impression on me, leaving me somewhere between “I want to be a dolphin trainer and work with sea creatures” and “I want to be a marine biologist” in my childhood. Growing up, my focus shifted towards art, and had the opportunity to start working from life at the New England Aquarium. I’d sit down with my travel set of watercolors, trying to replicate the beauty in what I saw. I started spending a majority of my time downstairs, in the jellyfish room- where I fell tentacles-over-bell for them. The long answer as to why I love jellyfish is that they have no brains. There is no possible way for them to any cognitive capability to grasp our presence. We as humanity have a direct relationship with jellies, albeit a primarily negative one. Our actions cause climate change, which bolsters the population of jellies, which lowers fish populations and makes beaches deadly. People are scared of jellies, not unreasonably so, but the immensity of their population is in almost entirety- our fault. Jellies have no way of knowing, reacting, or being about this, Its just how things are. These beautiful, deadly creatures float along, eating everything in sight, instilling a respectable fear- and they’re unaware of it. 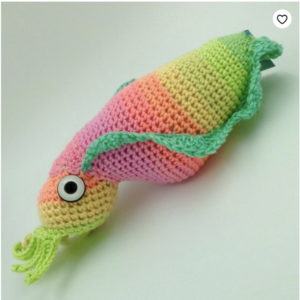 How long does it take you to make a crocheted cuttlefish? Cuttlefish actually take me the longest! So many fiddly bits- The bright rainbow one currently on my Etsy took about four hours! If you had a pet jellyfish (assuming you don’t) what would you name it? Oh! This is such a good question. I’ve never been asked this before. While I do not currently have a pet jellyfish- it’s on the to-do list! If I did have a tank of them, I would name them all Cavas. Which of your products do you recommend giving as a gift, as the holiday season is nearly upon us? 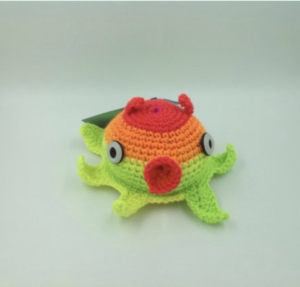 As a perfect gift this holiday season, I recommend either the Dumbo Octopuses or Keychains. Dumbos are lovely cuddly friends that make for a good desk/table/bed buddy, and they are so satisfying to squeeze. The keychains make great stocking stuffers, double as stress balls, and are perfect for the enthusiast on the go. And- they both come in a wonderful array of color variations, so there’s something for everyone! Come visit Taylor and many other vendors at the Cambridge Community Center on Sunday!